Evidence suggests that the effect of health expenditure on health outcomes is highly context-specific and may be driven by other factors. We construct a panel dataset of 19 countries from the Middle East and North Africa region for the period 1995-2012. Panel data models are used to estimate the macrolevel determinants of health outcomes. The core finding of the paper is that increasing health expenditure leads to health outcomes improvements only to the extent that the quality of institutions within a country is sufficiently high. The robustness of the results is assessed using various measures of health outcomes as well as institutional variables. 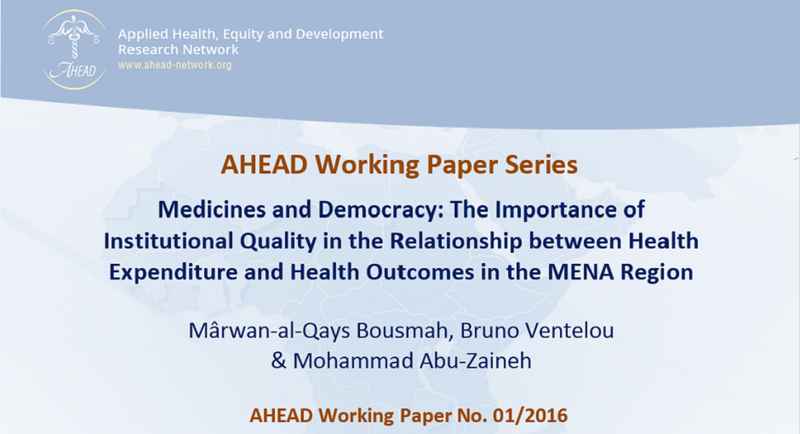 Overall, it appears that increasing health care expenditure in the MENA region is a necessary but not sufficient condition for health outcomes improvements.